In 2005, word began to circulate that the Washington Department of Natural Resources (DNR) was in negotiations to sell Lopez Hill to a developer. This information prompted a group of Lopez Hill supporters to find out what was actually happening and resulted in the formation of the Friends of Lopez Hill. 400 Acres of Lopez Hill, including the summit, are currently owned by the WA Dept. of Natural Resources. The DNR wanted to divest itself of parcels in the San Juan Islands (other parcels are Mitchell Hill on San Juan Island, Odlin South on Lopez, as well as parcels on Orcas and Blakely). 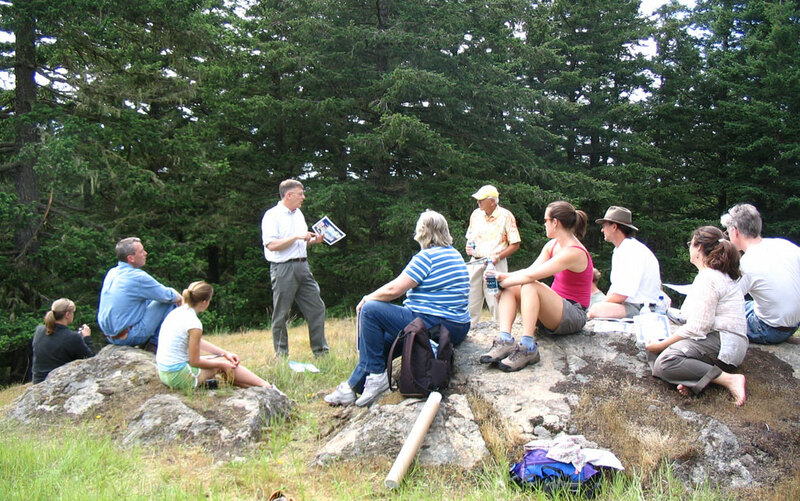 First, in May and June of 2006 we orchestrated a letter writing campaign to the DNR, receiving over 100 letters, invited members of the DNR and state and local legislators to visit Lopez Hill and were instrumental in bringing about a meeting in Friday Harbor with Doug Sutherland, WA State Commisioner of Public Lands and other DNR officials. The result of this meeting was that the DNR acknowledged the great community interest in Lopez Hill, removed the threat of any deal with a land developer, and they agreed to give the county 3 to 4 years to effect a transfer of the land to some public entity. We were successful in convincing the DNR that local residents were committed to seeing the property preserved for the public (and not sold to private developers) and they granted us 3 to 4 years to give us time to pursue various options and achieve our goal of guaranteed public access. Bill Wallace (Manger of the Washington Department of Natural Resource’s Northwest region) and Rep. Dave Quall meet with FOLH, San Juan County Land Bank, and San Juan Preservation Trust leaders at the top of Lopez Hill. June, 2006. In a second letter writing campaign we recieved letters from 35 people, including a number of students, and sent packages of information to each of 13 legislators in Olympia, including Gov. Gregoire on February 5, 2007. The FOLH members then contacted each legislator individually. This effort was a key factor in making sure that legislators were aware of Lopez Hill and in enlisting their support. Subsequently, the DNR placed Lopez Hill on their list of properties to be leased through the Trust Lands Transfer Program for 2007 – 2009. This went before the Washington State Legislature during the 2007 session. The funding for a 50 year lease of Lopez Hill to San Juan County was approved by the State Legislature at the end of the 2007 session. Negotiations between the county and the DNR were expected to be completed in the spring of 2009. San Juan County Parks was expected to take over management of Lopez Hill at that time. In June 2009, negotiations regarding the specific terminology of the lease were concluded and the lease has been signed by both the San Juan County Council and Peter Goldmark, Commissioner of Public Lands and head of the DNR. The Friends of Lopez Hill wish to thank all the volunteers who helped in this effort, as well as the advice and contacts by Tom Cowan and Bob Myhr. Their connections in Olympia were an important element in our success. Our goal immediate is to convert the 50-year lease with the DNR to a purchase agreement whereby San Juan County would own Lopez Hill forever.